Few terms are as controversial for pluralist and heterodox economists as neoclassical economics. This controversy has many aspects because the term itself has different specifications and connotations. Within this multiplicity what we mean by neoclassical matters to pluralist and heterodox economists for two primary reasons. First, because it informs how we view and critique the mainstream; second, because the relationship between heterodox and mainstream economics influences how heterodox economists model, apply methods and construct theory. 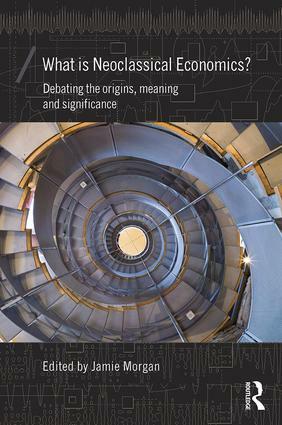 The chapters in this collection each have different things to say about these matters, with contributions ranging across the work of key thinkers, such as Thorstein Veblen and Kenneth Arrow, applied issues of non-linear modelling of dynamic systems, and key events in the history of economics. This book will be of use to those interested in methodology, political economy, heterodoxy, and the history of economic thought. Jamie Morgan is Reader at the School of Accounting, Finance and Economics, Leeds Beckett University, UK.